Speciality tools designed for inserting and removing C-type snap rings. Two types are available, one designed for holes (internal) and one designed for shafts (external). Straight and bent claws are interchangeable. 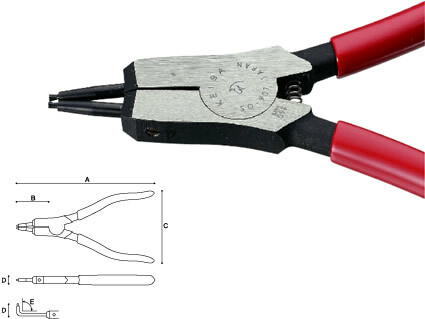 A special feature unique to Keiba pliers is the reverse-tapered claws which ensure that the snap-rings remain in place. Flat claws are also available and all claws are made of special steel material SKS-3.